Do you mourn the loss of Wally? I do not, in fact, first turn Item-lock was like a disease, one that needed to be snuffed out at the source, and it finally has been. Trevenant BREAK decks are now more balanced, but are they still good? Phantump with Ascension is what made this deck competitive in the first place, so does Trevenant BREAK choose to just go second now? The new Tapu Lele, the Promo Psychic-type one, is now legal — does that break this deck? This deck deserves much discussion. It took three of the Top 8 slots in the last stateside Expanded event, and all three of the lists played Wally (two even played two copies). So first, this deck can work, and still works well, even without Wally. 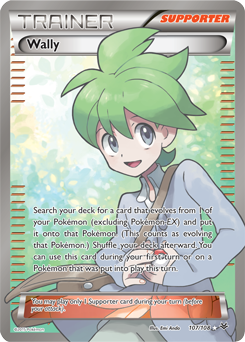 In fact, I’d say that Wally wasn’t even that great in the past format, and you might not have even had to play it. Let’s focus on Trevenant and Trevenant BREAK for a moment. Item-lock is oppressive as is, so much so, that Seismitoad-EX exists in a deck of its own. Trevenant can’t be played around except with Garbodor (Garbotoxin) or a Guzma / Lysandre on a Pokemon that’s not Trevenant. Silent Fear is one of the most broken attacks in the game, spreading damage around to your bidding and setting up the now infamous Tapu Lele for a game-winning Magical Swap attack. Best of all, it’s an extremely efficient deck by abusing Dimension Valley to attack for less of a cost. Figuring this all in the loss of Wally really doesn’t change the deck. It still does what it wants to, it can still play disruption cards to further pain an opponent, and it still retains some of the best matchups around by beating frail Item-reliant decks like Night March to a pulp and beating Buzzwole-GX builds into the dirt as well. Zoroark-GX has been a big problem for Trevenant for some time now, and that’s where the disruption cards come in. So really, what’s stopping this deck from being oppressively strong? Nothing really, I think it might arguably be the best deck in the format going into the first major Expanded format event of the year. Time will tell, but it’s extremely well-positioned for a big run once more with the ban of Hex Maniac, and better yet, the combination ban of Hex Maniac and Puzzle of Time. Now Zoroark-GX decks won’t even be able to recover their Energy, let alone get around the Item-lock of Trevenant. This card synergizes with Mysterious Treasure, finds your tech Supporters, and has a relevant attacking option with Dimension Valley out and a single Energy. It’s better than any non-Psychic type support Pokemon because you want to avoid playing anything more than the four Mysterious Treasure in this deck, that’s really all you need. Starting it is no big deal since it has a single Retreat Cost. The biggest newcomer to this deck is finally here, and it’s nothing to scoff at. Once feared as a potentially bannable card, it’s time for the format to bend to an easily-accessible means of moving damage. Silent Fear does 30 damage to each of your opponent’s Pokemon, but if you think about it empirically with Magical Swap, you’re doing “more than that” if there are multiple Pokemon on your opponent’s field. Each Pokemon is another 30 damage, so you’ll be doing more than you think once it comes time to move that damage around to your liking. Just three uses of Silent Fear if your opponent has six Pokemon on the field equals 540 damage, enough to one-shot three 180 HP Pokemon with Magical Swap. Tapu Lele as an addition to the deck creates many new awkward situations that your opponent will have to attempt to play around. Espeon-EX is a consideration here, instead of or in addition, but Zoroark-GX without Hex Maniac is a lot easier to beat even without devolution on tap. One of the most obscure uses to Tapu Lele (or Espeon-EX) for that matter) is that it provides a way to attack a Latias-EX, a Pokemon that’s impenetrable by Trevenant and Tapu Lele-GX.